Especially suited for verification, installation and maintenance of residential and commercial networks. 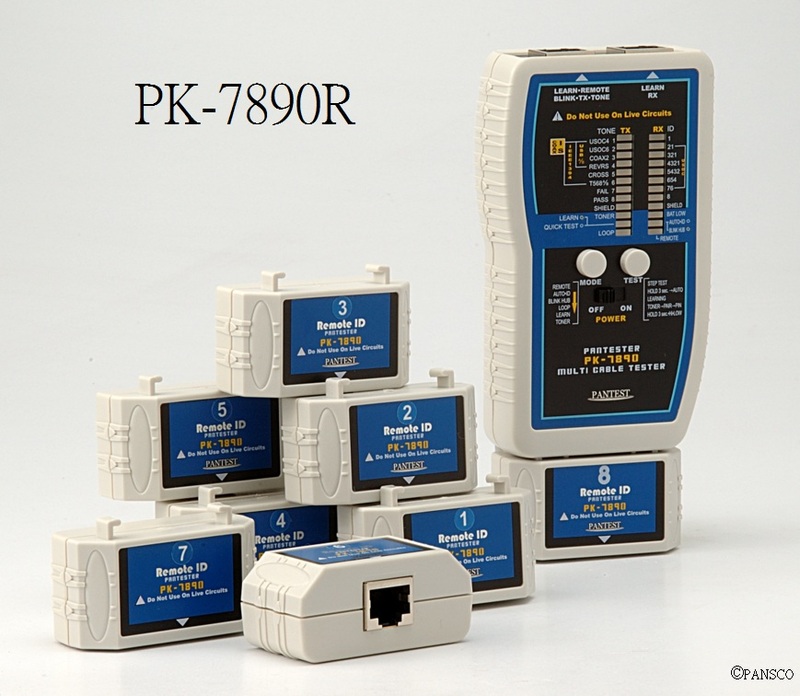 PK-7890PL: Remote unit with PoE and line voltage detector. PANTESTER is an advanced multifunction pin-by-pin cable tester to verify cable integrity of Datacom. Telecom and Coaxial cables and displays the test results on the main unit. 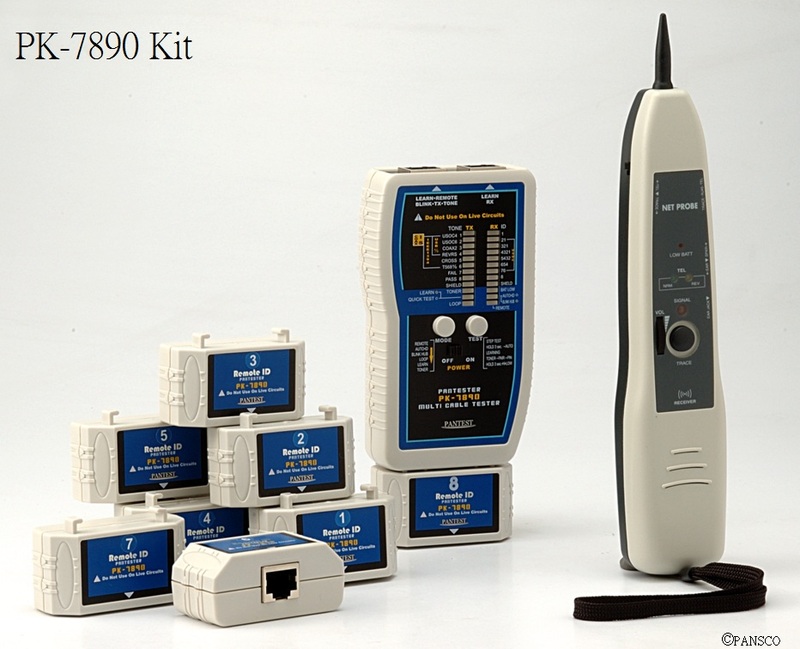 PK-7890PL, the remote unit includes PoE and line voltage/polarity detector with identify RJ45 outlet for PoE existence and type PSE either end-span A or mid-span B in your network and tests line voltage and polarity to protect tester damage from live circuits. It includes 8 separate remote ID terminators allows one person to view test results for 8 installed cables at a time to save time and money. Capabilities including (A) Auto/ID test function – It allows users to quickly check up to 8 installed data, voice and Coax cable at a time. It displays the passes cable type, ID number and identifies crossover, reversed or faulty cable in a second. (B) Blink Hub function – It blinks the Hub/Switch port light for easy outlet and cable identification, locate corresponding port on Hub/Switch. (C) Learning function – It makes testing cable in any quantity a snap. It memory’s stores any standard or custom configuration and performs on instant no-button check on each new cable plugged in, makes testing large quantities of cable quicker and easier. (D) Tone generator function – It allows you to send a Hi/ or Low tone on individual pin or pair and on all pins simultaneously to locate a wire break. The tone generator traces cable using a tone detectable by Net Probe (PR-06P) or any market tone probe. It will make work shorter and easier for the professional and the layman alike. Checks actual pin-to-pin configuration of 1 ~ 8 pin cables. Displays test results TX/RX on the main unit on remote testing. Tests and troubleshoot data, telephone, video and Coax wiring to over 300m. Generates 2 selectable tones on selected pin, pair or on all pins for tracing cables. Network ID - Hub blink to identify location on a HUB/Switch/Router port. Support up to 8 testing and ID remotes for network, telephone and Coax cables. Auto/ID test - displays passes cable type and ID or faulty cable in a second. Learning function allows testing any custom configuration in any quantity for Pass/Fail a snap. Performs loop-back or remote tests with Auto/Step scans for displaying cable configuration. Optional RJ45 to F or BNC adaptors enable one person to test 8 installed F/BNC cables at a time. 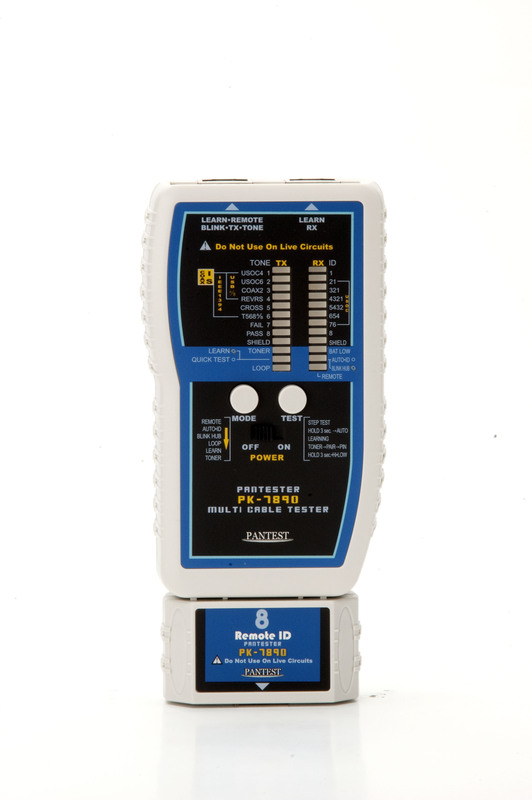 Optional PK-7890PL includes test and PoE/Line detection remote is used to protect tester damage from live circuits. It checks line voltage/polarity and identify RJ45 outlet for PoE existence and type of PSE either end-span A or mid-span B or ultra power over 4 pair in your network.